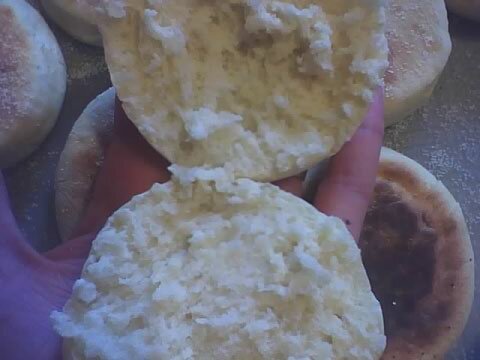 I made these English muffins weeks ago, but didn’t get around to writing this until now. More accurately, they didn’t turn out perfectly, so I didn’t want to write this. I still kind of don’t. Even more accurately, I initially thought they turned out really nicely, but then I came across another blog with pictures of better-looking homemade English muffins, and some fairly harsh/snarky words about other, less nooked-and-crannied English muffins being nothing more than English-muffin-shaped rolls, and I got both embarrassed by and angry at my stupid muffin-roll imposters, and then I really didn’t feel like writing this. Much less posting pictures. But this is something I’ve got to get over; I’ve got to write this post, and I’ve got to put up the pictures. The point of this blog isn’t to make things perfectly; it’s to learn how to make (and eat, and shop for) new things, and to do so without fear of failure. Kind of corny and cliche, yes — but as someone who cried for two days upon receiving her first B in college, accepting the less-than-perfect things that come out of my kitchen has always been a major struggle. In a small saucepan, whisk 1 cup milk with 2 tablespoons sugar, and heat until the milk is bubbling but not boiling. Add 1/4 cup butter, and remove from the heat, stirring occasionally until the butter melts; let cool to room temperature, and add 1 cup warm water. In a large bowl, whisk together 4 cups flour, 1 teaspoon salt, and 2 1/4 teaspoons (or one package) dry yeast, then stir in the wet ingredients and beat until smooth. Gradually add in enough flour to make the dough thick and kneadable — it’ll take about 2 more cups. Punch the dough down into a ball, place it on a lightly floured board, then roll out to 1/2-inch thickness. 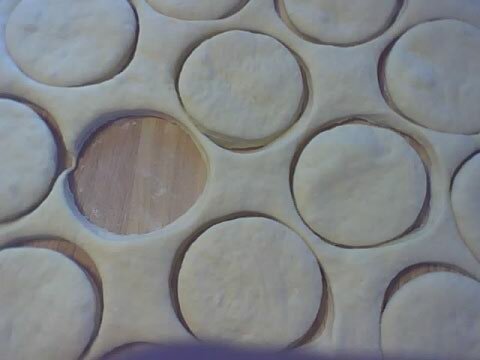 Using a biscuit cutter or the mouth of a glass, cut out a bunch of dough circles. Place the circles onto the cream-of-wheat-sprinkled cutting board, then sprinkle the tops with cream of wheat as well. Gather the scraps and reroll the dough, repeating until you’ve used up as much dough as possible, or until you’re bored. As the muffins finish cooking, you can transfer them back to the cutting board or parchment paper; when they’re cool, use a fork to split them. They tasted awesome toasted with butter, and we ate them merrily for about a week. But now I hate them because they don’t look like this (not the website that hurt my feelings, in case you were wondering). 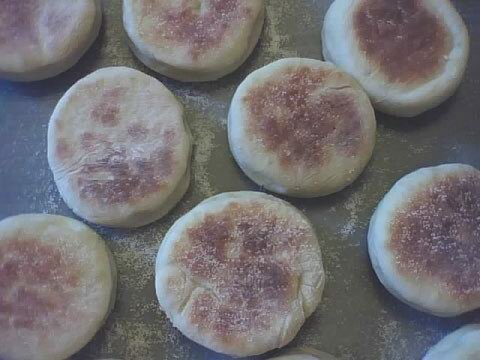 welsh muffins, at the very least? Sunny they look great – quit worrying so much! You and Sam C. are way too critical about your cooking. Thank you! I surround myself with dorks, so on a day-by-day basis, it doesn’t faze me. But I can’t assume my readership is comprised entirely of dorks, so I’ve got to throw down some disclaimers.